To the naked eye, Tommy Woodard's digital photograph appears to be nothing more than a pretty picture of trees in Provo Canyon. But zoom in, he says, and the purple glow of a saucer hovering at an angle above the tree line starts to take shape. Woodard, 22, a photo librarian with the Utah Film Commission, took the photo that he believes represents an unidentified flying object. He was in the canyon Tuesday shooting still pictures for a possible film location, and began taking pictures for himself on his way out. At the time, he didn't see anything out of the ordinary in his photograph. But later, after noticing a black speck in the frame, he zoomed in and "the closer I got, the more impressed I got by it," he said Thursday. "I was kind of skeptical but it's pretty obvious when you zoom in," said the self-described "sci-fi" fan, whose friends and colleagues are similarly impressed. 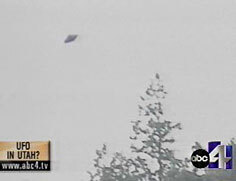 Woodard said he's a "believer" because the recent photograph is not his first encounter with mysterious flying objects. Once, playing baseball at the age of 10, he saw three blurry gray spheres rotating in the sky. Within a moment, they were gone. Woodard contacted officials at Hill Air Force Base to ask if any planes were flying in the canyon area Tuesday but hasn't heard back yet. "They kind of laughed, you know," he said. Hill Air Force Base spokeswoman Lt. Caroline Wellman told The Associated Press on Thursday she is awaiting response from the 388th Fighter Wing whether any of their F-16 jets were above Provo Canyon Tuesday. Another skeptical reaction to the digital photograph came from a representative of the National UFO Reporting Center in Seattle -- he said thought the sphere looked like a bird. God is making some pretty peculiar birds nowdays! "A bird?" asked Woodard in disbelief. "Come on -- I don't know how he could think it's a bird!" Woodard discounted the theory that the image could be nothing more than a speck of dust on his film. Of the hundred photos he shot Tuesday, none contained a similar mark, he said. The Provo Canyon photograph is not the first reported UFO sighting this year to immediately get debunkers. In March, the Mexican air force captured images of bright blurs in the sky using infrared equipment. The videotape aired on television for the first time last week, with one scientist saying the objects could have been caused by gases in the atmosphere.